Buhari Gets Follower Delivered To His Medical Apartment By A UK Well-wisher - You Know What That Means? We should continue to pray for Mr. Buhari and Nigeria this one they have started delivering followers. 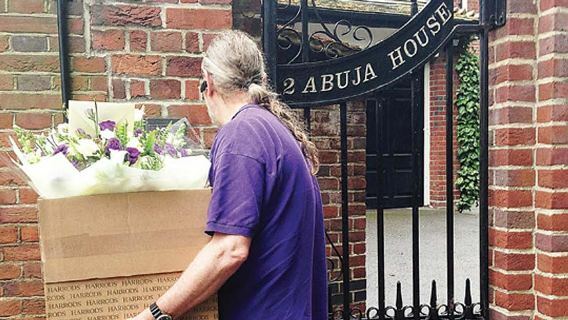 According to highly reliable source as seen in the picture above, well-wishers of President Buhari recently delivered flowers and get-well messages at the Nigerian House in the UK where the president is currently staying for his medical check up. The Nigerian president is currently battling an undisclosed ailment. Buhari's ill health has frustrated government activities in Nigeria, as reports said cabal in his government persuaded him not to formally handover to his Vice Prof, Osinbajo, while he left the country on indefinite medical leave to the UK, making his Vice unable to swear in already confirmed ministers or even sign into law the 2017 budget as passed by theNational Assembly. Nigeria may be heading for more difficult times in the next coming days and months, than it did during the dark sick days of late president Umaru Yaradua. There is a lot happening behind the scene which an ordinary eye cannot see. A special prayer session should be said daily for Vice President Yemi Osinbajo for his safety and wisdom in this very difficult time of his political life.